A constant creator, Pablo Picasso utilized all kinds of shapes when designing ceramics, but for his plates, there are only four plate shapes that exist in the Picasso oeuvre: circular, oval, square/circular and rectangular. Picasso knew them inside and out, and knew how to contour them to fit his artistic visions. Each plate was chosen specifically to realize his visions and although only Picasso knows why he chose the plates that he did, we can guess based on his oeuvre. The circular plate is an even distance all the way around and ranges in size with diameters of 18.5 cm to 42 cm. Such a plate would allow Picasso to easily alter its contours during the firing process making them softer or deeper, depending on his choosing. This in turn would enable him to create a scene that was more balanced. An example would be Picasso’s ceramic, Jacqueline au chevalet (Jacqueline at the Easel), 1956 (pictured) that portrays Picasso’s last wife Jacqueline Roque painting at an easel. In this imagery the whole plate is taken up in equal balance leaving minimal space but still allows the viewer a whole scene as it drops over the edges of the plate. The oval plate is essentially in the shape of an egg and has one size of around 33 cm x 40 cm. The majority of his works in this form are of abstract faces, so perhaps the form reminded him of people he knew or he saw it as the prefect form of self-expression. Most of these works appear to be deceptively simple until you look closer at their complex color scheme or detailed imagery. An example is Picasso’s ceramic, Face in an Oval, 1955 (pictured) where there is a charismatic face gazing out against a russet and black background with a vibrant green border. The work appears simple yet upon closer look, the result is a stunning mixture of Picasso’s skill as a colorist and ceramic artisan, as the complex color scheme with a glazed surface almost makes the work glow. The square/circular plate is a mixture of equal sides and rounded edges, but is elongated, having one size of around 21 cm x 21 cm. The deception of this plate appearing to be larger and longer than it is most likely allowed for Picasso to explore his visual frontiers on such a finite medium. He could place things anywhere he wished, as it needn’t be harmonized or coherent as it could hide behind the shape of the plate. An example is Picasso’s ceramic, Fruits, 1948, which portrays an abstract cactus in the middle of the plate, with flowery strokes creating the border. There is no harmony in the work as the cactus is uneven and the border flowers are heavily dominant around one corner. However the cactus anchors the composition as it rests in the middle and with the flowers on the lip, your attention is always being drawn to somewhere. 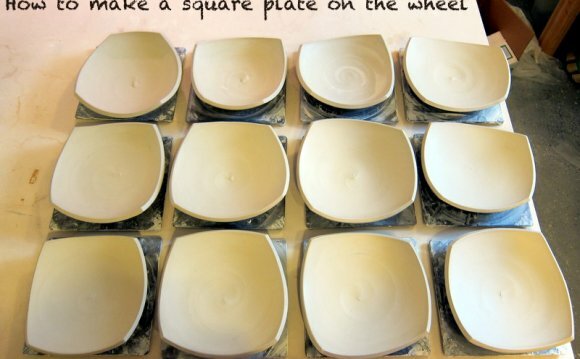 The shape of the plate assists in utilizing the lack flow, which is a brilliant deception to the eye. The rectangular plate is longer on one side than the other and has two sizes, one at 39 cm x 32 cm and a larger one at 51 cm x 31 cm. Picasso utilized this form mainly for portraits, so it is easy to see that such an elongated plate could easily allow him to add features and details that he was not able to do on the smaller forms. The length also highlights the boundary of the lip, which is naturally softer in this form of the plate therefore enabling him to create the stronger borders that are seen in most of the works. An example would be Picasso’s ceramic, Goat’s Head in Profile, 1952 (pictured) which displays a beige goat in green highlights against a beautiful blue background bespeckled in dots with a strong border. This goat is perfectly framed by the rectangular form of the plate, which deceives our eyes from recognizing the goat’s finite existence. So enthralled are we with the details that make the imagery appear endless, that we never seem to notice we’ve been mislead which is why Picasso took such pleasure in the ceramic medium.